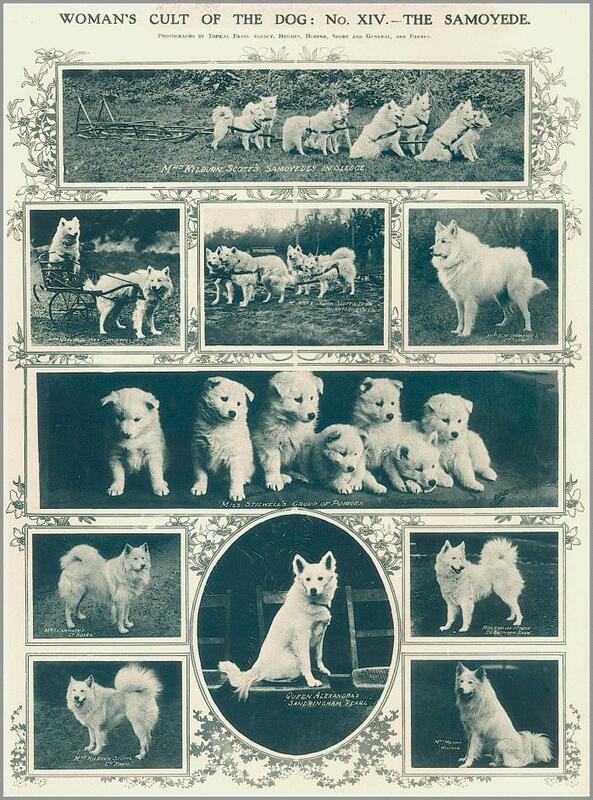 1rst row: Mrs. Kilburn Scott's Samoyedes in Sledge. 2nd row L. to R.: Mrs. Kilburn Scott's Samoyedes in cart, Mrs. Kilburn Scott's Team in Antarctic Sledge, Mrs. O. M. Ommaney's CH. Snowy. 3rd row: Miss Stilwell's Group of Puppies. 4th and 5th row middle: Queen Alexandra's Sandringham Pearl. 4th row Left: Mrs Cammack's CH. Kosko. 4th row Right: Miss Eveline J. Curtis' CH. Salthrop Snow. 5th row Left: Mrs. Kilburn Scott's CH. Fang.